"The pressure to be GREAT is too much. I would rather be known as the "just o.k. 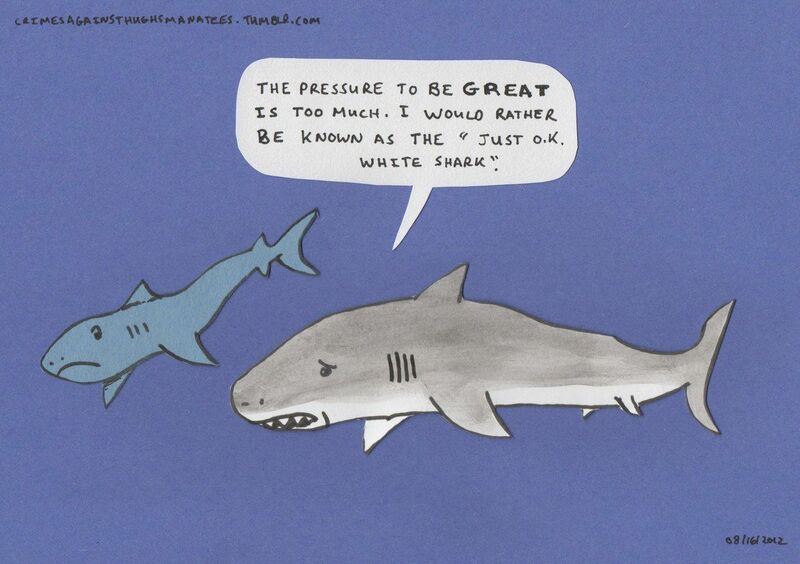 white shark"
Are we afraid to become something great? To feel that others look up to us and that we are role models for our peers and followers? Would you rather just stay "just o.k. ", or become a star in society and a giant in the world? After watching each episode of Shark Tank, every fan feels some level of inspiration and motivation to become a business shark. But how many of us act on it? How many of us begin taking the right steps on the path to becoming one? We turn off the T.V. or Hulu and think that things are gonna happen on their own...but to no avail. The Sharks didn't get to where they are today by sitting and wondering what it would be like to be rich, they worked and didn't give up till they did. Barbara Corcoran started with $1,000. Robert Herjavec started with mere pennies. We have more than that. In today's day and age you can sit at you kitchen table and become a millionaire via the internet. You can create a product and knock on doors until you sell it. It's hard, but what do you expect?